Check out 50 free profiles with full contact details. 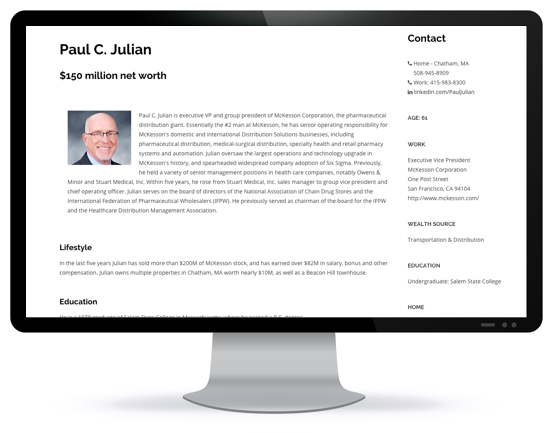 AffluenceIQ connects Wealth Managers, Nonprofits, and Luxury Marketers with Massachusetts' wealthiest families. FIND NEW CLIENTS, DONORS AND CUSTOMERS TODAY. AffluenceIQ is the only Database providing intelligence on the highest net worth families in Massachusetts. With your one-year subscription, you'll have unlimited access to more than 2,000 profiles of individuals with a net worth of $10 million or more. Wealth Managers, Attorneys and Accountants will find investment advisory and estate planning clients. A range of Nonprofits can target future donors. Colleges and Universities will discover wealthy alumni. Purveyors of Real Estate, Yachts, Private Jets, and other luxury goods and services, will find ideal prospects. Sign up and receive special alerts about new features, products, discounts and more.